At this year’s Plast Eurasia in Istanbul, Turkey, Barlo Plastik A.Ş., the Turkish representation of Sumitomo (SHI) Demag will present efficient and economic solutions for injection moulding packaging applications. 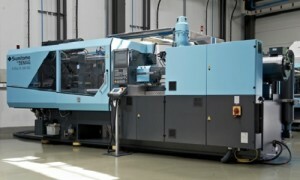 The highlight exhibit will be the El-Exis SP hybrid high-speed machine with IML. At the fairground, the company will demonstrate production of food containers with IML on an El-Exis SP 200-920 with a clamping force of 2,000 kN. Along with the handling of Polymac Robotics b.v., the injection molding machine is designed as a compact IML manufacturing cell, producing the container in less than 3.5 seconds. The cups are made in a four-cavity (PP) mould of polypropylene made by Otto Hofstetter AG and have a shot weight of approximately 6.2 grams. As introduced, the decentralized electric drive of the clamping unit allows fast and sensitive opening and closing of the mould on the El-Exis SP-machine, thus ensuring a highly accurate mould-stop position. This ensures the precise positioning of the labels and a correct removal of the finished cups. The NC5 plus control guarantees a simple, clear and intuitive operation of the machine, the hybrid drive system with energy recycling saves up to 40% of energy. In addition to the standard technology modules activeQ/Q+ integrated, activeCool&amp;Clean and activeAdjust, the optional technologies activeMotionControl, activeScrewDrive, activePowerLink and activeEcon are used. Plast Eurasia will be held at 04 – 07 December 2014.